I love that my mother stopped asking me about the weather a month ago. My answers were fast turning into "hotter" "sticky crazy humid" "yuck". I could complain about it until the cows come home. I try not to but sometimes it just feels good to vent it out loud. Especially if you're in line somewhere. Then it's instant validation that you're not exaggerating. It really feels sticky as glue out there. Except today. Today was one of those days you just want to hug. Like Lucy hugs the snow. I wanted to hug today. It looks cuter with a toddler than a 35 year old though. But heck, if Jen is willing to give it a go during the Food And Light Photo workshop this month, maybe we can do a little "Helen hugging the gorgeous Colorado" weather photo shoot. Nah....it still is not as endearing as little Lu. You could think that now would be the time we only eat ice cream or frozen treats. And we do. Some. Not only and not always. The only things keeping us cool are the shades and a quick dip into the ocean. As far as desserts go, we don't really change our eating habits that much beside more salads instead of cooked vegetables and more sorbets than usual. Honeydew and peach sorbets are currently "curing" in the freezer actually. With B's college friends visiting these past few days I made sure that we had plenty of food to put on the grill, cold drinks to be mixed and lots of homemade ice cream to dig our spoons into. Turns out, the first thing they asked me to make was some tartelettes. Go figure. They've known my nickname upon ten minutes of meeting me 10 years ago. We are extremely lucky to have bushes upon bushes of wild blackberries in the neighborhood and I seem to be the only one interested in picking them. One morning, I took my sweet time and picked about three cups worth. We ate some with creme fraiche one morning, they were sweet and juicy but remembering all the scratches I got and spiders I met on my picking expedition, I decided to freeze the precious blackberry loot. Dear friends call for uncorking the bubbly, busting out the pretty plates and using said precious berries in simple and fragrant tartelettes. This is pretty much my go-to recipe for fresh fruit tarts. The dough is really easy to come together and is sturdy enough to give just the right amount of crunch. I chose a mix of blackberries and raspberries from the market but you could make these with any fruit that is in season. The trick, what sets them apart, comes from the 20 minutes that the fruit spends marinating in a fragrant herb sugar. Yep. That's my little secret: I simply rub some sugar with one of the herbs growing in the garden for a minute and let the fruit steep in it. If it's just us, I won't remove the herbs at all but for guests, I'll usually strain the sugar before sprinkling it on the berries. Right now I am on a lemon thyme or lemon balm kick but mint, lemon verbana, chamomille work quite well. Such a simple thing to do and yet it takes the tarts from good to intriguing. Like adding another layer of goodness. One simple step. I hope you will give it a try and let your imagination or your garden lead you to discover new flavor combinations. I use this flour combination the most because 1/ these are the least expensive gluten free flours out there and like most of us who bake a lot, I have to pay a close eye on the budget and 2/ because their flavors combined are mild enough that non gluten free folks are not taken aback by the taste or the texture. If you choose to make one 9-inch tart with this, you might want to double up on the berries and add more sugar to taste. I used a combination of butter and leaf lard (more info on this here) but feel free to use all butter or half shortening - half butter which keeps the crust nice and flaky. Lard also has less saturated fat than butter. In a mixer, whip the butter on medium speed until light and airy. Add the egg yolks, one at a time and beating well after each addition. Mix until incorporated. Add the salt, and all the different flours, and the xantham gum and mix briefly. Add enough milk to moisten it. Dump the whole mixture onto a lightly floured (use more rice flour) board and gather the dough into a smooth ball. Flatten the dough into a disk, wrap it in plastic wrap and refrigerate for an hour. When the dough is nice and cold, roll it out on a lightly floured board or in between two sheets of plastic to fit your prefered pie pan. If the dough tears while you roll or/and transfer into the pan, just patch it with your fingertips. Line the dough with a piece of parchment paper, fill with pie weights or dy beans and par bake for 10-15 minutes until almost completely baked. Remove the weights and parchment paper. At this point you can refrigerate the baked crust for up to 3 days before using. Roll some extra dough to form lattice pattern on top if desired. You can also freeze the extra raw dough for up to three months. Place the berries in a non reactive bowl. Rub the sugar and thyme together and sprinkle over the fruit. Gently mix with a spatula. Let the fruit marinate for about 20 minutes. 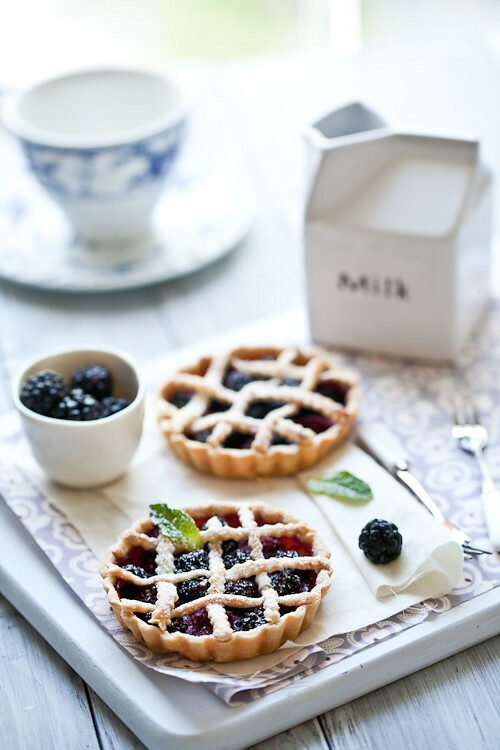 Divide the berries among the tart shells, top with lattice if desired and bake 20 minutes. 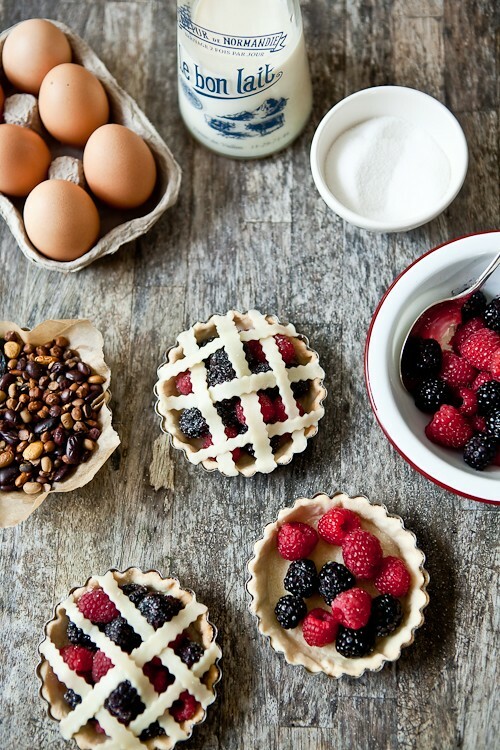 Let the tarts cool completely before eating. Depending on the water content in the fruits, some may release more juice than others so be aware when you eat...it might drip. Dans le bol d'un mixer, battez le beurre pendant 1 minute. Ajoutez les jaunes d'oeufs un a un, tout en melangeant bien apres chaque jaune. Ajoutez le sel et les farines sans gluten, le sel et la gomme de xantham. Ajoutez assez de lait pour humidifier la pate. Melangez brievement et verzes le contenu sur un plan de travail. Ramassez en boule et metter au refrigerateur pendant une heure. Etalez la pate sur un plan de travail legerement farine (farine sans gluten de preference), ou entre deux feuilles de papier sulfurise. Foncez en un plat a tarte, mettre une feuille de papier sulfurise dans le fond, et des pois/riz. Faire pre-cuire 10-15 minutes. Sortez la tarte du four et laissez refroidir. Roulez des bandes supplementaires de pate pour faire le motif du dessous si desire. Placer les fruits dans un bol non reactif. Melanger du bout des doigt le sucre avec le thym citron. Verser en pluie sur les fruits et melanger delicatement avec une spatule. Laizzer macerer 20 minutes. Repartir les fruits rouges au fond des tartes, ajoutez les bandes de pate si desire et cuire 20 minutes at 180C. Thanks for letting us all in on your trick! What a good idea! Oh how I love summer--especially when it comes to your creations! I'd even put up with the humidity to come and eat one of these beauties! I don't think anyone in their right mind could resist such succulent berries in a cute little tartelette crust like that - but I wanna know what leaf lard is :) Seriously! I don't know. 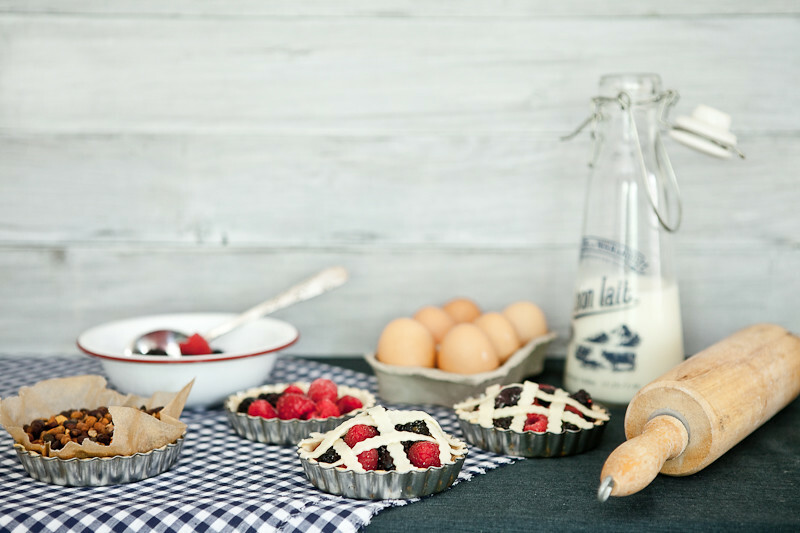 What beautiful tarts, and thank you so much for sharing both GF and wheat-flour options with us. I have some high-quality lard in my fridge that is begging for a new recipe and I'm pretty sure I've found it. Beautiful tartelettes and beautiful photographs! Such an adorable size. My next purchase of baking supplies will have to include mini tart pans. What a great idea about the herbs! Now, if only I had an herb garden. Love these!! I don't own any mini tart pans, but will have to rectify that soon! I'm amazed you are the only one interested in those wild berries...I wish I could stumble onto some around here. What a blessing that is!! I used to go blackberry picking with my grandfather growing up. It was a hot job because we had to wear long pants and long sleeves to keep from getting pricked all over, but the oh the reward of those plump blackberries covered in milk and a bit of sugar!! Je me réjouis déjà de ta tartelette pour cet été en allant à la cueillette des mûres sauvages. À quoi te sert la gomme de xanthane dans la pâte ? This is wonderful. I love the blue contrasted with the lovely crust. Sigh. I wish I was better at baking! Heh, I think you've earned your nickname well. These are gorgeous. I love the idea of herbs--I'm going to use it as soon as we get our berries! I'm so jealous that you have berries already. We don't get ours till July and August. So beautiful and summery. I can't resist those berries and find your compositions simply amazing. I love your pictures and your recipes ! It's beautiful ! Thank's ! Your tartlets are gorgeous and so are your photos! How VERY quait is tha! 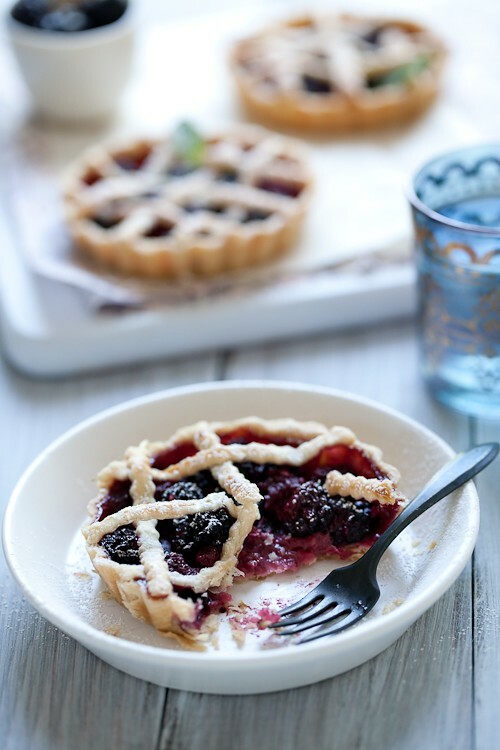 I love the rustic-ness of these little tartlettes and all the photos are just awe-inspiring! great amazing photos, specially the second one. and the tartelettes looks sooo yummiiii. i would like to try this recipe. These look lovely. They are perfect as they are just right for one person to enjoy. I love the idea of fragrant sugar, it must really add to the dish. I would love to have blackberries so close to hand, they are worth all the spider attacks! Such beautiful tartelettes! Perfect for summer. Fantastic! This is why I love visiting your blog! These look so gorgeous! I remember those sultry, steamy days and nights when I lived on Sullivan's Island. Even the ocean breeze was hot, sticky and full of salt. Sigh. Still...SUCH a beautiful place to live. Dear Helen, sorry about the last comment - I was reading two blogs and made a mess in the comments... Sorry! These tartlets are so pretty - I made something similar using strawberries, they're in season here in Brazil, both the flavor and the price are wonderful! These are absolutely adorable. This would be a wonderful dessert for a summer dinner party. I'm already dreaming up the rest of the menu! Oh goodness, how pretty are these? Perfect for a July 4 celebration! absolutely beautiful. has me craving tarts now too! What a great idea about marinating berries with herb sugar! Thank you for being my inspiration! Lovely photography, as always. These look gorgeous by the way; a lovely pudding for summer! 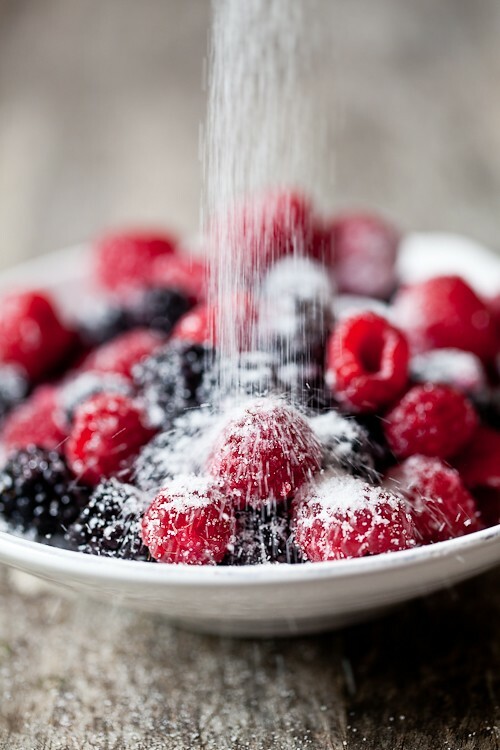 The picture of the sugar over the berries = FABULOUS!!! I may have to get over my crust-aversion and make some tartlettes soon! Oh, these are so pretty! I think I will try this using rosemary...I've paired it with blackberries before and the combination is quite pleasing. I think I need to add herbs to my baking more often - maybe when I'm in NC I can get together some pots of herbs to use :) And, as always, your tartelettes are simply beautiful and beautifully simple. Your photos and recipes are always so inspiring! And this is no exception. I also love that you use leaf lard in your dough too! That looks so good. I love your photographs! Your pictures are so beautiful and always induce sweets cravings! Yum, these sound lovely. Sometimes simple tarts are the best kind. I can't wait for summer to return! Beatiful and they're making me :D! Such beatuies! No doubt your guests enjoyed every mouthful. I can hardly wait for my herbs to be large enough to take cuttings from and I'll try my hand at one of these myself. Your photography is amazing and you just seem to whip these culinary works of art up in no time. I am going to try to make these next week! Well now I'm so sad I didn't buy those cute little mini tart pans a few weeks back in Charleston. Yes, I'm with everyone else here...your photos are beautiful. I find myself staring at the photos and forgetting to read the recipes. very very jealous of your neighborhood berry bushes. we used to be able to get wild blackberries when we lived in Washington, but not down here in San Francisco. There's nothing to compare them with the less-interesting cultivated types. These are beautiful! I love the lattice tops, perfect! These look so amazing. If I was visiting you from college (oh to be that age again) I would be asking for those too. My Man's Belly: college was a long time ago for me and even longer for my husband but I am glad he kept in touch with his buddies! La Cuisine des Trois Soeurs: oui, la gomme remplace tous les elements du gluten et permet d'avoir assez d'elasticite pour rouler les pates. Yay! Berry season. And that's one gorgeous berry tart. We had icky humid weather here too, had a break for a couple of days but looks like it's back. You have the most gorgeous blog and I can spend the whole day reading it. Wish you were teaching some classes in India too :)!!! So crisp and real... excellent!! Lovely touch to marinate the berries in herb sugar. I would be smiling ear-to-ear if one of these pretty tarts was set in front of me. I don't have a kitchen for 3 months and it's just killing me! Especially in "berry season" when I'm usually baking tarts non-stop. Someone is however, bringing me a very small oven (that fits on a stool). Hopefully I will be able to resume baking somewhat. These are adorable. And delicious, I'm sure. These tartelettes are beautiful! How did you cut your lattices with the crimped edges? Is there a tool you use? I love it! Wow, those are the most stunning tartlettes! These are stunning!! I love the second shot! 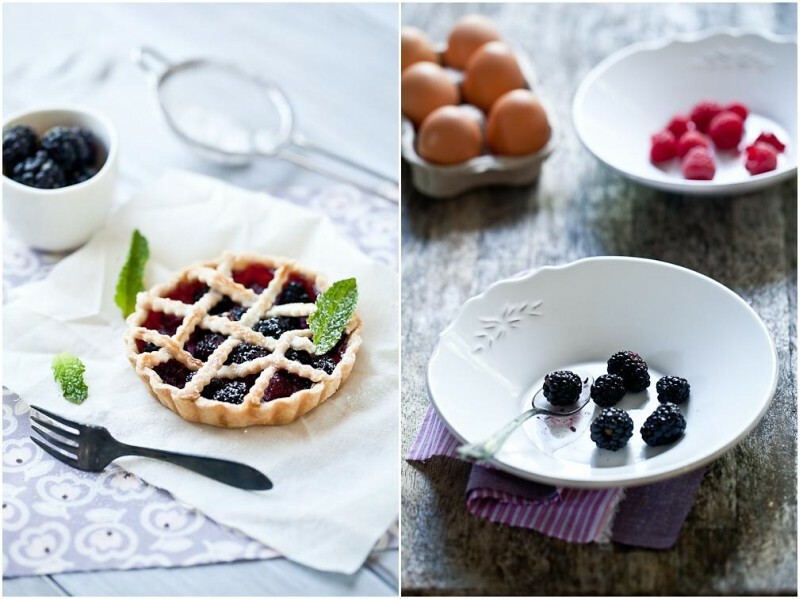 Stunning pictures & these berry gf tartlets look so appetizing too! I am living GF since june 2010! I love all of your tasty & fab recipes! j'adore tes tartelettes même si je ne connaît pas quelques ingrédients, elles sont magnifiques!! !